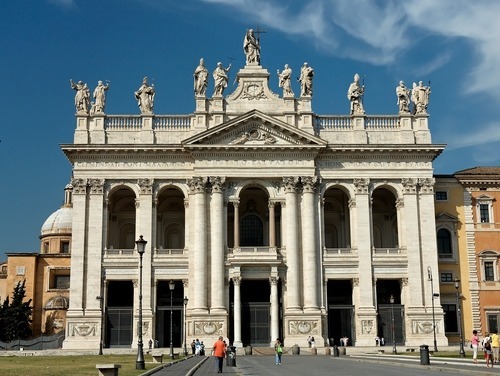 This year we get to celebrate the feast of the Dedication of the Lateran Basilica on a Sunday. It was one of the first churches to be built by Christians following the early persecutions. It was raised by the Emperor Constantine and consecrated by Pope Sylvester on this day in the year 324. Originally celebrated only in Rome, the feast became universal in the Roman Rite as a sign of unity with the Holy See. The church continues to be the Cathedral Church of the Bishop of Rome, the Pope. It is often referred to as the Mother of all churches in Rome and of the world. The church building is a sign of the Church gathered for worship. The congregation is composed of us, the living stones that together make-up the Body of Christ.By our Baptism we are consecrated to God and given the vocation to be the holy members of His Body. The Rite for the ceremony of the Dedication of a church says: The church building is the place where the Christian Community gathers together to hear the Word of God, to offer up prayers of petition and praise, and, in a principal way, to celebrate the Sacred Mystery of our Faith. The Blessed Sacrament of the Eucharist, a unique image of the Church, is reserved here. The altar is surrounded by people made holy by participating in the sacrifice of the Lord and nourished by the celestial banquet. The august Sacrament is a sign of Christ, who is priest, victim and the altar of His own sacrifice. During the Vigil Mass this Saturday I shall commission some new extra-ordinary ministers of Holy Communion who will assist with the distribution of Communion at Mass; pray for them, that they may be devoted to the Blessed Eucharist. We are approaching the Days of Solemn Exposition of the Blessed Sacrament - The Forty Hours’ Prayer - in our Parish: 27-29th November. Please make a note of these days during which we can especially come to offer our prayers to Christ Who abides continually in the Sacrament of the Altar. God bless you all!